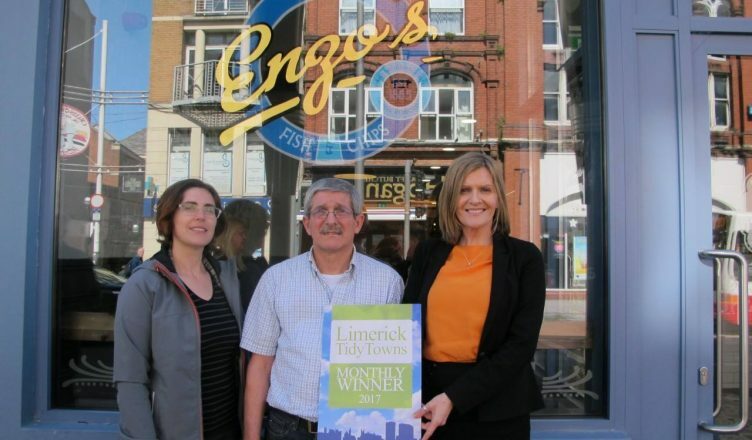 The Limerick City Tidy Towns monthly award for May 2017 has gone to Enzo’s Fish & Chip restaurant at 60 William Street, following its recent extensive renovation. Pictured outside the premises being presented with the award by Sharon and Maura is owner Enzo Rocca. We were hugely impressed with the beautiful renovation of this very popular Limerick restaurant, following its recent re-opening. Enzo’s is a Limerick institution which has been totally transformed following its recent overhaul, with the façade getting a complete face-lift and the old signage and paintwork being replaced by a striking sapphire shop front with beautifully crafted gold leaf signage in a very traditional and authentic style. The interior of the shop has also been re-designed to match, and overall it is a great asset to William Street as a whole. Enzo’s first opened on William Street in 1984 as an Italian restaurant but soon established itself as one of the most popular fish & chip restaurants in the city, with a loyal customer base. They take great pride in the quality of their product and only use the finest potatoes and freshest fish, cooked to perfection and always served with a smile by its friendly staff, eliciting great reviews even from international visitors to the city, including famously a Financial Times journalist in 2001 who described the food as “excellent” and commended Enzo’s for its “impeccable service”. The service is still the same and has now been enhanced by its bright new surroundings. Please do call in to see and taste for yourself, or call them on 061 414942. 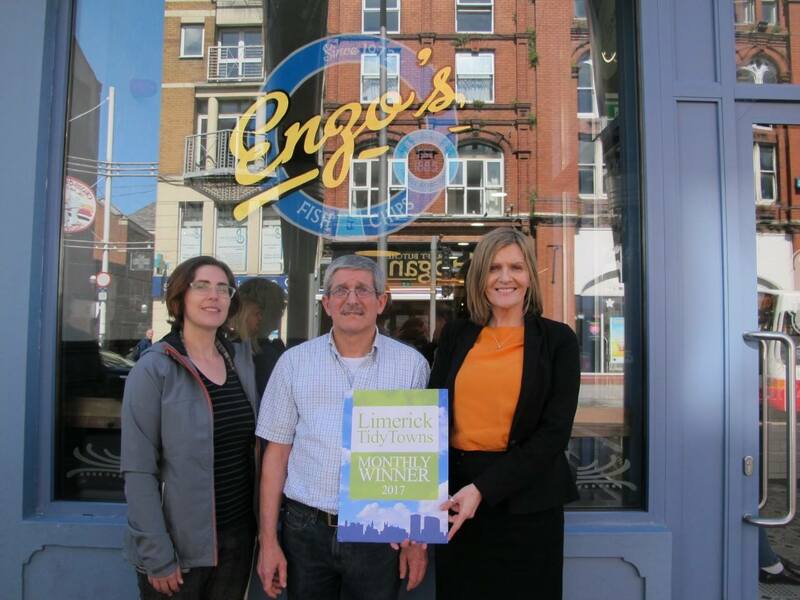 Enzo’s is the fifth Limerick City Tidy Towns winner for 2017, following Billy Higgins Clothing in April, No 1 Pery Square in March, Casey’s Londis Mount Kennett in February and Narrative 4 in January, and all monthly winners will be in with the chance of winning the overall prize for 2017 at our annual awards event to be held early in 2018. Many thanks as always to Katie Glavin from I Love Limerick for taking the photographs for this and all of our monthly awards.